You offer free shipping, why was I charged shipping on my order? Site says you do not accept orders from my location I am located in the USA is this correct? Why don't you post your phone number on the site? How do I know what my shipping time will be? My order has a status of "Processing" what does that mean? My order status is listed as "Partially Shipped", what does that mean? My order status is listed as "Shipped", what does that mean? Why do California shipments have longer shipping times? Why do black finished, weighted, magazines , and long guns have longer shipping time? Why did you order the items and have them shipped directly to me from the manufacturer without checking with me. I have asked for my order to be canceled and a refund issued, how long until I get my refund? I placed an order and didn't receive a receipt or any update emails, why? Do your guns leave the blue rub off residue on the inside of holsters when wet molding? What is the difference between a Weighted gun and an UN-Weighted gun? We offer free shipping on all items EXCEPT the Taco Holster / Sheath Press, this is due to the the agreement made with the manufacturer of the press. All other items purchased with the press will still get free shipping, the only item that is used to calculate shipping rates is the press. NO, we except all orders from USA addresses. If you are accessing this site from a mobile device try to access it with a computer. You may also want to use the web browser Internet Explorer to access the site. We don't post our phone number because we also are holster makers ourselves which requires us to be in a noisy leather shop making phone conversations difficult. The site will answer most all questions. We answer our email very quickly so there usually isn't a need to call, just send us an email and we will get back to you. Your shipping time is displayed on the individual product page after you choose your options (i.e. Finish, Weighted). The shipping time will show in large red text. Processing means we do not have the item on hand. The item will be made and shipped directly from the manufacturer to you with use covering the associated fees. The estimated shipping time is displayed on the individual product page when you choose the options. You are also reminded of the estimated shipping times when you agree to them during checkout and at the bottom of the email you receive any time your order status changes. The estimated shipping time for "Processing" items is10-20 business days Monday-Friday most but not all cases. Weighted, Black Finished, Magazines, and Long guns shipments are ESTIMATED at 10-20 business days shipping M-F.
California and International shipments are ESTIMATED at 20-25 business days shipping M-F. most but not all cases. Multi Molds items not in stock are ESTIMATED at 10-20 business days shipping M-F. This means that you have placed an order that has some items that are in stock and some that are not. The items in stock will be shipped immediately and the out of stock items will be shipped directly from the manufacture to you with us covering the associated extra fees. The estimated shipping time is displayed on the individual product page when you choose the options. You are also reminded of the estimated shipping times when you agree to them during checkout, and at the bottom of the email you receive each time your order status changes. You will receive the tracking information on both shipments as they ship. Below will be what the estimated shipping times will be for a partially shipped order. In stock items 5-7 business days M-F.
Out of stock items will have ESTIMATED *NOT GUARANTEED* SHIPPING TIME of 10-20 business days M-F shipping in most but not all cases. California and International shipments are ESTIMATED at 20-25 business days shipping M-F. This means that you have placed an order for items that are all in stock and will ship immediately. You will receive a tracking number when the order is shipped. The estimated shipping time for in stock items is 5-7 business days M-F. If items ordered are on hand they will ship immediately with an estimated 5-7 business days shipping time. If items ordered are NOT on hand they will have an estimated 20-25 business days shipping time. California shipments for items NOT on hand have longer shipping times due to the manufacturer not being setup to collect CA sales tax so it prevents them from directly shipping items to you. Black finished, weighted, magazines, and long guns have longer shipping times because we currently do not keep these items pre-made in stock, they are considered more of a custom order and the manufacturer takes longer to mold them. We have plans to stock these items in the future and will notify customers when we begin stocking them. Our goal is to get items to you as fast as possible. We didn't check with you because you were given the estimated shipping time before you processed the order in three different locations, the product page, during checkout when agreed to our policies, and at the bottom of the email you received any time your order status changes. Our process is mentioned on the site in several places. If you would like to cancel an order for items you placed that were out of stock just contact us with your order number and we will process a refund after we confirm the item hasn't shipped. Your refund will be process as soon as we confirm that the order hasn't shipped. Keep in mind that credit card companies, banks, and Paypal will take a few days for the refund to show in your account. We offer several discounts in different formats depending item / qty. ordered and order total. 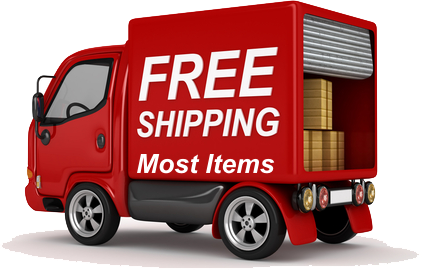 We give you free shipping on all orders, we give bulk discounts on most of our hardware supplies depending on quantity ordered; the price breakdown is listed in a chart on the individual product page. All receipts and email order updates are sent automatically from the site when you place an order or when your order is updated with information. If you haven't received any emails from us then you have provided an incorrect email address during checkout or the emails have been sent and blocked by your email provider. We suggest using an email that you often check and not an AOL address due to their well known issues with blocking non-spam emails. Your order number is listed at the top of the order confirmation email that you are sent to the email you provided during checkout. The email is sent to you automatically by the site when you placed your order. You can also login to your account and obtain all information about orders you have placed. At one time Blueguns applied a blue finish coating to the guns. They have since changed the material they use to make the guns and the top coating that was previously applied is no longer needed or applied any longer. A weighted gun has added weight to simulate the actual weight of the real loaded gun. An UN-weighted gun does not have the extra weight added.